The property has been well maintained by the current owner and enjoys views over the River Orwell towards the town centre. 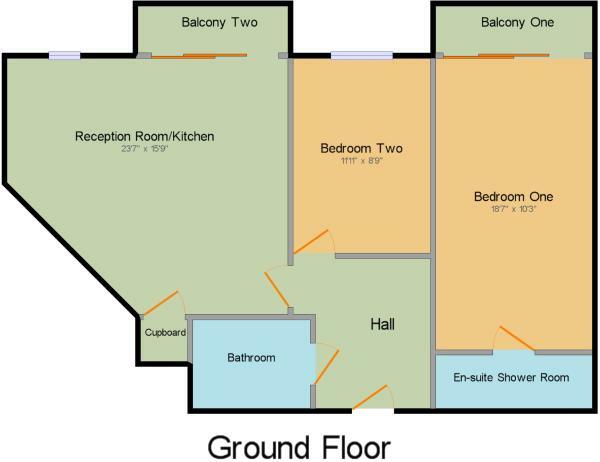 The apartment has a large hall, which leads to the lounge/kitchen, both bedrooms and bathroom. The lounge is a good sized room with access to it's balcony, has a large storage cupboard and is open plan to the kitchen, which is well fitted with a range of units. The master bedroom has it's own balcony and an en suite shower room, and the second bedroom is of generous proportions. There is also a three piece bathroom. The property also comes with parking. Compair Crescent is located within striking distance of Ipswich train station and has easy access in to Ipswich town centre. There are local shops on the development, and a wide range of shopping, dining and recreational facilities are at the town centre. There is the River Path providing walks along the river, and the Bobby Robson bridge gives pedestrian access over the river. Disclaimer - Property reference IPS180693. The information displayed about this property comprises a property advertisement. Rightmove.co.uk makes no warranty as to the accuracy or completeness of the advertisement or any linked or associated information, and Rightmove has no control over the content. This property advertisement does not constitute property particulars. The information is provided and maintained by Abbotts, Ipswich. Please contact the selling agent or developer directly to obtain any information which may be available under the terms of The Energy Performance of Buildings (Certificates and Inspections) (England and Wales) Regulations 2007 or the Home Report if in relation to a residential property in Scotland.